When opening a 64-bit crash dump you will find that you will not necessarily get a sensible call stack. This is because 64-bit crash dumps need to have all the binaries available to them in order to resolve the callstack properly. Typically crash dumps don’t come from your machine but someone else’s, be it from your Quality Assurance lab or one generated by a customer out in the wild. This means you might not have the correct versions of all the binaries to hand that were referenced in the dump. Thankfully, the symbol server in Visual Studio comes to our rescue! This allows the call stack resolver to search for the binaries at the locations supplied to the symbol server and it will find the correct version for you as long as it is hosted at one of the listed addresses. 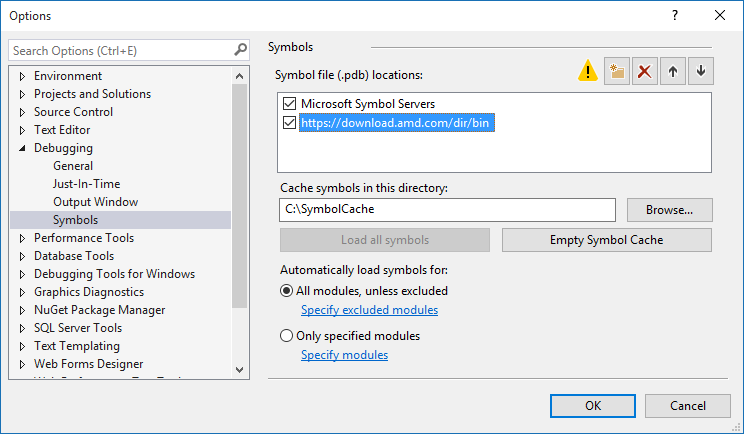 By default, the symbol server is only aware of the Microsoft® symbols but you can now also point it to the AMD driver binaries. This includes the DirectX® 11, DirectX® 12, OpenGL™, Vulkan™, Mantle, LiquidVR™ and Crossfire™ driver binaries. We host symbols for all of the drivers we publish, and we update it when new drivers are released. Please note that we currently just host the binaries (in our case these are a set of DLLs), not the PDBs which is what you would need to resolve function names. There are currently no plans to release the PDBs. So to add support for the AMD driver binary symbols, all you need to do is add “https://download.amd.com/dir/bin” to your symbol server search path, and then you are good to go. Updated 23rd May 2018 to include the new paths. Updated 8th January 2018 to include the new paths. Updated 7th February 2017 to show the https path. Gareth Thomas is a Developer Technology Engineer at AMD. Links to third party sites are provided for convenience and unless explicitly stated, AMD is not responsible for the contents of such linked sites and no endorsement is implied. This is great, but it would be more great if it was kept up to date! 😉 The last driver version in there is 16.9.2 from Sept 22. Looking in a folder like this: http://download.amd.com/dir/bin/atidxx64.dll/ in your browser will show you the date each driver was uploaded. Looking at the contents of a refs.ptr file like this http://download.amd.com/dir/bin/atidxx64.dll/57DC4D6Fa64000/refs.ptr will give you the driver version of that dll. If the binaries for the driver you’re using are not on the symbol server, and you possibly don’t even have the driver installed on your system, you can extract the driver package exe (ex: non-whql-win10-64bit-radeon-software-crimson-16.10.1-oct6.exe) using a tool like 7-Zip into a folder on your hard drive. Then you can right click in the call stack on an unresolved function call, Load Symbols, and point to the location of the extracted dll (ex: C:\Users\stevem\Downloads\non-whql-win10-64bit-radeon-software-crimson-16.10.1-oct6\Packages\Drivers\Display\WT6A_INF\B307644\atidxx64.dll). Where can I get symbols for kernel drivers (*.sys) ? Thanks! What about symbols for the ADL SDK? You mean atiadlxx.dll and atiadlxy.dll? They seem to be there ok.